Season the shrimp with salt and pepper and brush on both sides with the Bourbon Barbecue Sauce. In the meantime make the grits/polenta and keep it warm. Grease a cast iron grill pan with the oil. Grill the shrimp over moderate heat, turning once, until cooked through, about 4 minutes. 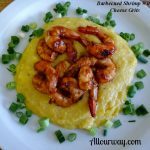 Serve with cheese grits and additional barbecue sauce.